From Romantic Castles and Palaces, As Seen and Described by Famous Writers, edited and translated by Esther Singleton; New York: Dodd, Mead & Company, 1901; pp. 179-182. FEW amongst us who tread the Dublin of the present in all its beauty, think of the Dublin of the past in all its contrasted insignificance. True, the eternal features are the same; the landscape setting of the city is coeval with creation. Tyrian, Dane, and Norman have looked as we look, and with hearts as responsive to Nature’s loveliness, upon the emerald plains, the winding rivers, the hills draperied in violet and gold, the mountain gorges, thunder-riven, half veiled by the foam of the waterfall, and the eternal ocean encircling all; scenes where God said a city should arise, and the mountain and the ocean are still, as of old, the magnificent heritage of beauty conferred on our metropolis. But the early races, whether from the southern sea or northern plain, did little to aid the beauty of nature with the products of human intellect. Dublin, under the Danish rule, consisted only of a fortress, a church, and one rude street. Under the rule of the Normans, those great civilizers of the western world, those grand energetic organizers, temple and tower builders, it rose gradually into a beautiful capital, the chief city of Ireland, the second city of the empire. At first the rudimental metropolis gathered round the castle, as nebulæ round a central sun, and from 180 this point it radiated westward and southward; the O’Briens on the south, the O’Connors on the west, the O’Neils on the north, perpetually hovering on the borders, but never able to regain the city, never able to dislodge the brave Norman garrison who had planted their banners on the castle walls. In that castle, during the seven hundred years of its existence, no Irishman of the old race has ever held rule for a single hour. And what a history it has of tragedies and splendours; crowned and discrowned monarchs flit across the scene, and tragic destinies, likewise, may be recorded of many a viceroy! Piers Gravestone, Lord Lieutenant of King Edward, murdered; Roger Mortimer — “The Gentle Mortimer” — hanged at Tyburn; the Lord Deputy of King Richard II. murdered by the O’Briens; whereupon the King came over to avenge his death, just a year before he himself was so ruthlessly murdered at Pomfret Castle. Two viceroys died of the plague; how many more were plagued to death, history leaves unrecorded; one was beheaded at Drogheda; three were beheaded on Tower Hill. Amongst the names of illustrious Dublin rulers may be found those of Prince John, the boy Deputy of thirteen; Prince Lionel, son of Edward III., who claimed Clare in right of his wife, and assumed the title of Clarence from having conquered it from the O’Briens. The great Oliver Cromwell was the Lord-Lieutenant of the Parliament, and he in turn appointed his son Henry to succeed him. Dire are the memories connected with Cromwell’s reign here, both to his own party and to Ireland. 181 Ireton died of the plague after the siege of Limerick; General Jones died of the plague after the surrender of Dungarvon; a thousand of Cromwell’s men died of the plague before Waterford. The climate, in its effect upon English constitutions, seems to be the great Nemesis of Ireland’s wrongs. Strange scenes, dark, secret, and cruel, have been enacted in that gloomy pile. No one has told the full story yet. It will be a Radcliffe romance of dungeons and treacheries, of swift death or slow murder. God and St. Mary were invoked in vain for the luckless Irish prince or chieftain that was caught in that Norman stronghold; but that was in the old time — long, long ago. Now the castle courts are crowded only with loyal and courtly crowds, gathered to pay homage to the illustrious successor of a hundred viceroys. The strangest scene, perhaps, in the annals of vice-royalty, was when Thomas Fitzgerald (Silken Thomas), son of the Earl of Kildare, and Lord-Lieutenant in his father’s absence, took up arms for Irish independence. He rode through the city with seven score horsemen, in shirts of mail and silken fringe on their head-pieces (hence the name Silken Thomas), to St. Mary’s Abbey, and there entering the council chamber, he flung down the sword of state upon the table, and bade defiance to the king and his ministers; then hastening to raise an army, he laid siege to Dublin Castle, but with no success. Silken Thomas and five uncles were sent to London, and there executed; and sixteen Fitzgeralds were hanged and quartered at Dublin. 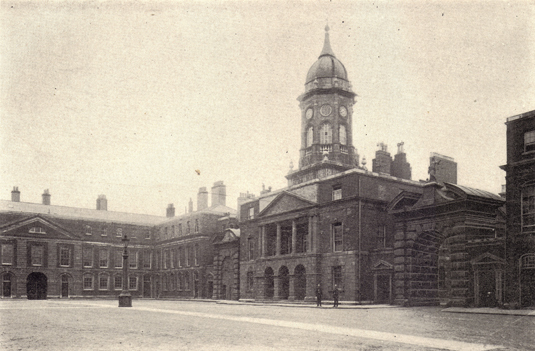 By 182 a singular fatality, no plot laid against Dublin Castle ever succeeded; though to obtain possession of this foreign fortress was the paramount wish of all Irish rebel leaders. This was the object with Lord Maguire and his papists, with Lord Edward Fitzgerald and his republicans, with Emmet and his enthusiasts, with Smith O’Brien and his nationalists — yet they all failed. Once only, during seven centuries, the green flag waved over Dublin Castle, with the motto — “Now or Never! Now and for Ever!” It was when Tyrconnel held it for King James. In the ancient stormy times of Norman rule, the nobility naturally gathered round the Castle. Skinner’s Row was the “May Fair” of mediæval Dublin, Hoey’s Court, Castle Street, Cook Street, Fishamble Street, Bridge Street, Werburgh Street, High Street, Golden Land, Back Lane, etc., were the fashionable localities inhabited by lords and bishops, chancellors and judges; and Thomas Street was the grand prado where viceregal pomp and Norman pride were oftenest exhibited.